"My first time in a maternity ward was not for my child but for Michael's. Michael invited us into to the room to introduce Prince to me and Wayne. We both gave him a hug to congratulate him and all I could remember noticing was the look on Michael's face. The look of absolute pride. I had never seen him looking calm and yet so confident and happy without saying a word. At that moment I think I felt that kinship of manhood, that only comes from becoming a father. A wonderful moment." "Words can't describe how I feel... I have been blessed beyond comprehension and I will work tirelessly at being the best father that I can possibly be. I appreciate that my fans are elated, but I hope that everyone respects the privacy Debbie and I want and need for our son. I grew up in a fish bowl and will not allow that to happen to my child. Please respect our wishes and give my son his privacy." "There is no miracle in life that compares with watching your child come into the world. I love family life....everything about it. I want them to grow up being surrounded by love and by family." "(Fatherhood has changed me) in a huge way. You have to vallue your time differently, no doubt about it. It´s your responsibility to make sure they´re taken care of and raised properly with good manners. But I refuse to let any of it get in the way of the music or the dance or the performing. I have to play two different roles. I always wanted to have a big family, ever since I was in school. I was always telling my father I would outdo him. He had 10 children. I would love to have like 11 or 12 myself." "You do the best you can. You don´t isolate them from other children. There will be other kids at the school (on my property). I let them go out into the world. But they can´t always go with me. We get mobbed and attacked. When we were in Africa, Prince saw a mob attack in a huge shopping mall. People broke so much stuff, runing and sceaming. My biggest fear is that fans will hurt themselves and they do. I´ve seen glass break, blood, ambulances." "(...) I try to make sure they (my children) are respectful and honorable and kind to everybody." Michael Jackson in his reflection "My Childhood, My Sabbath, My Freedom"
"But now I am a father myself, and one day I was thinking about my own children, Prince and Paris and how I wanted them to think of me when they grow up. To be sure, I would like them to remember how I always wanted them with me wherever I went, how I always tried to put them before everything else. But there are also challenges in their lives. Because my kids are stalked by paparazzi, they can’t always go to a park or a movie with me. So what if they grow older and resent me, and how my choices impacted their youth? “Why weren’t we given an average childhood like all the other kids”, they might ask? I hope that they will always focus on the positive things, on the sacrifices I willingly made for them, and not criticise the things they had to give up, or the errors I’ve made, and will certainly continue to make, in raising them. For we have all been someone’s child, and we know that despite the very best of plans and efforts, mistakes will always occur. That’s just being human." "I love and adore my children. They mean everything to me. When they’re in public though, I conceal their faces, cause I want my children protected. At home, they have a normal life, they play with other kids and they have a good time, they’re laughing a lot. They run around, they even go to school. It’s a normal life for them. But in public, I must protect them. I love my children very much, and I’m proud to be their dad." "(...) Well, I enjoy taking care of my children myself. It's fun. It's why I had them. So I could take care of them. It's great relief for me. It's pleasure. It keeps me happy and laughing. They're wonderful, sweet, innocent children. They (my children) mean... It's hard to put in words, because they mean everything. The way you would explain how your children make you feel... They're the world for me. I wake up and I'm ready for the day because of them. I get them breakfast, I change diapers, if they want to read, we do a lot of reading, we play hide and seek, we play blind fold, and I have a wonderful time with them. I do my best. Sure. I want to be the best father in the world, of course." "He was an absolutely fabulous father. I never met a parent that is as good or better than Michael. Those kids were and absolute deligt! I´ve never met kids in my life that were like those kids. I spent a lot of extended time around them. I never heard them cry, I never heard them beg for anything, never saw or heard them throw a fit..."
"He was a great father. People don´t realize much of the time he didn´t even have a nanny. He was single father. He´d make them breakfast, talk to them, take them out to see shows, let them watch work. Then he´d call a tutor over and they would study while he recorded." "(...) It was amazing for me to witness in those early years how enamored Michael was with his children. He changed their diapers through the night, sang and played with them, rocked them to sleep, bathed them and had to change his own outfits when they threw up on him – the same routine that all parents know and love. In the few times we spoke, he would always reflect on the miracle of being a parent. He also protected them in a way that reflected his own lost childhood, and his paranoia about being taken advantage of. 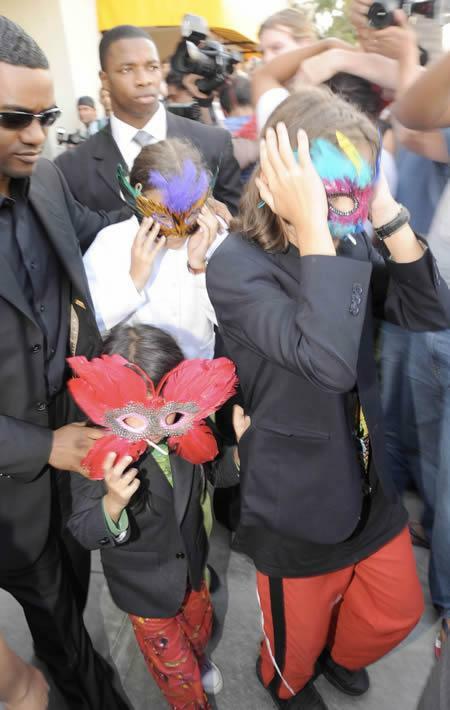 Paris, Prince and Blanket are three beautiful children. With Michael gone, I truly pray that they will find some peace and be spared the heart wrenching pain that their father faced time and time again in his life. "(Parenthood) reminds you to do what the Bible has always taught us. When the apostles were arguing among themselves over who was the greatest in Jesus’ eyes, he said, "None of you", and called over a little boy and said, "Until you humble yourself like this child." It reminds you to be kind and humble and to see things through the eyes of children with a childlike wonderment. I still have that. I’m still fascinated by the clouds and the sunset. I was making wishes on the rainbow yesterday. I saw the meteor shower. I made a wish every time I saw a shooting star." "They love music…they are very much into the arts. But I don’t push them. I am letting them enjoy their childhood as much as possible. I really do. I let them go to the arcade and get out and go to the movies and do things. I think that comes naturally. You know, I want them to get to do the kind of things I didn't get to do. So I fill them with a lot of enjoyment that way – a lot of amusement. You know? I get pretty emotional when I see them having a wonderful time; when they are on a ride and they are screaming and they are happy and they are running. It makes me emotional, cause I see they are having a real good time." "Just like our jury foreman, I went into this trial about as neutral as one couldbe towards Michael Jackson. I was 7 when Thriller came out so I grew up with his music and loved it, but I knew very little about his life other than what I'd seen in the media, and I honestly had no strong feelings about him as a person either way. I walk out of this trial completely understanding why he has so many fans who practically deify him. Who are so strongly attracted to his kind spirit, huge heart, gentle nature, love of his children and mother. I totally get it now. "Every single witness who was questioned about whether they thought MJ was a good father (and almost every one who knew him closely was asked) sang endless praises about his love of his kids. If Prince's testimony is any indication, MJ was definitely a great father. The kid is bright, intelligent, caring, has great character and a great personality, and I truly believe MJ did a phenomenal job raising him in the few years he was able to. Honestly, every single juror came away feeling very positive about Michael Jackson as a person and father. I know there was concern about MJ's image being hurt because of this trial, and maybe to outside viewers it was because of some of the details that came out. But for us in the jury in that courtroom for all these months, we just grew more and more fond of him during the course of the trial." You are recognized as a great artist all over the world, but very few know you as a father. We have been close friends and have known you over twenty-five years. We have spent many times together with you, Prince, Paris and Prince Michael, who all played happily with our own grandchildren. We, and our children, who are of your generation, have always admired you as a loving and caring father. Your children could not have had a better father. They love and respect you. You raised them with gentleness, kindness and genuine concern for their well-being. Their joy and love are a reflection of your attention and love as a parent. Those who criticize and judge you should do well to look into their own family life. We have seen you countless times as an attentive and devoted father and we join your many friends who stand beside you and your family now.